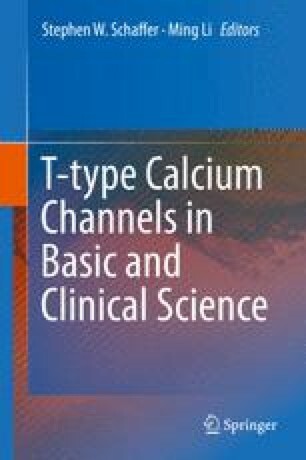 T-type Ca2+ channels play many important physiological functions in different tissues; this makes the channels targets for extracellular and intracellular regulation. T-type Ca2+ channels in many non-excitable cells provide an essential mechanism for Ca2+ entry at voltages near the resting membrane potential, which revises the homeostasis of the intracellular Ca2+ concentration to promote cell cycling and cell duplication. Consistent with this function, many of the extracellular signals stimulate the expression of T-type Ca2+ channels. The intracellular signaling pathways regulating the T-type Ca2+ channels are frequently observed in excitable cells. In these cases, the role of T-type Ca2+ current is to modify threshold and the shape of repetitive firing of action potentials. Therefore, intracellular signaling pathways can either up- or downregulate T-type Ca2+ channels. The regulation of the α1H isoform of the T-type Ca2+ channels is frequently located on the intracellular loop between domains II and III.